Prime Minister Narendra Modi is, by far, India’s most popular political figure. And the intensity of his support is much stronger than that enjoyed by other leading politicians. He enjoys robust backing among both his own party members and adherents of the opposition, and in rural areas as well as in cities. Fully 87% of Indians say they have a favorable opinion of Modi. This backing is up from 78% in 2013, prior to his election as prime minister. (See this Pew Research Center survey for pre-election sentiment.) And this support is quite intense. Almost seven-in-ten Indians (68%) have a very favorable view of the BJP leader today. Modi is popular across the demographic spectrum – to both men and women, and among all age groups, educational backgrounds and income levels. As might be expected, 94% of BJP followers support the leader of their party. However, it is notable that 74% of backers of the rival Indian National Congress party (INC) also see Modi favorably. The difference is in the intensity of that support. More than eight-in-ten BJP partisans (83%) have a very favorable opinion of Modi. But only about four-in-ten Congress followers (41%) feel as strongly positive about the prime minister. Rural areas have not traditionally been a stronghold of BJP support; historically that has been the preserve of the Congress party. Yet Modi’s strongest backing now comes in rural areas: 89% living in the countryside see him favorably (73% very favorably) versus 84% of city dwellers (59% very favorably). Men (72%) are also more likely than women (64%) to voice intense enthusiasm. Those who are satisfied with the direction of the country are more likely to have a lot of confidence in Modi than those who are dissatisfied with the country’s direction. And Indians who view the current economic situation as very good are more likely to have a lot of confidence in Modi than those who think the current economic situation is only somewhat good. Roughly six-in-ten Indians (62%) express a favorable view of Rahul Gandhi – the Congress party’s vice president and heir apparent. Gandhi was the party’s candidate for prime minister in the 2014 election, and his favorability has actually improved since before the voting, up 12 percentage points. But the intensity of his current support (20% very favorable) is dwarfed by the passionate backing enjoyed by Modi. Not surprisingly, 77% of Congress party members are favorably disposed toward Gandhi. But it is notable that 60% of BJP backers also see him in a positive light. About two-thirds of Indians living in rural areas (66%) have an affirmative view of Gandhi, possibly reflecting the long-standing rural base of the Congress party. Roughly half of urban dwellers (53%) express a favorable opinion of him. And Indians with a primary school education or less (63%) are more supportive than those with at least some college education (54%). Gandhi’s mother, Sonia Gandhi – president of the Congress party – is seen favorably by 58% of those surveyed. Her positive rating is up 9 points since 2013. But only 21% voice a very favorable view of Sonia Gandhi. As with her son, rural Indians (61%) are more likely than city dwellers (50%) to support her. Younger Indians and those with a lower income are more positive about Mrs. Gandhi than are older Indians and those who make more than the median income. And she enjoys bipartisan favorability: 78% by Congress adherents and 54% by BJP backers. Arvind Kejriwal, the chief minister of Delhi and the national convener of the Aam Aadmi Party (AAP), a relatively new political grouping with an anti-corruption platform, is viewed favorably by 60% of Indians, including 25% who are very supportive. His own party is particularly behind him: 73% are very favorable toward Kejriwal. His support is stronger among Indians with some college education (71%) than among those with a primary school education or less (53%). Kiran Bedi, another anti-corruption activist who was the BJP’s 2015 losing candidate for chief minister in Delhi, enjoys a 48% favorable rating. Only 14% see her in a very favorable light and 20% voice no opinion, making her the least well-known of the political figures in the survey. It is better-educated Indians who voiced her strongest support: 62% among those with some college education compared with just 42% among those with a primary school education or less. And while 54% of BJP followers favor her, only 37% of Congress supporters back Bedi. The popularity and the intensity of public support for the BJP mirrors that accorded its leader. An overwhelming 87% of those surveyed have a favorable view of the BJP, including 65% who hold a very favorable impression. As with Modi’s popularity, the party’s strongest backing is in rural areas: 70% in the countryside have a very favorable view of the BJP, compared with 53% who give the party intense support in cities. The Indian National Congress party is seen favorably by 61% of Indians. But just 16% have a very favorable opinion of the party that has ruled India for 54 of its 68 years. Consistent with its historical roots in small villages and towns, 64% of rural Indians have a positive opinion of Congress, greater than the party’s 52% favorability in urban areas. Congress is seen more favorably in the southern states (68%) of Andhra Pradesh, Karnataka and Tamil Nadu and eastern states (67%) of Bihar, Jharkhand, Odisha and West Bengal, but less favorably in the western (49%) states of Gujarat, Maharashtra and Chhattisgarh. 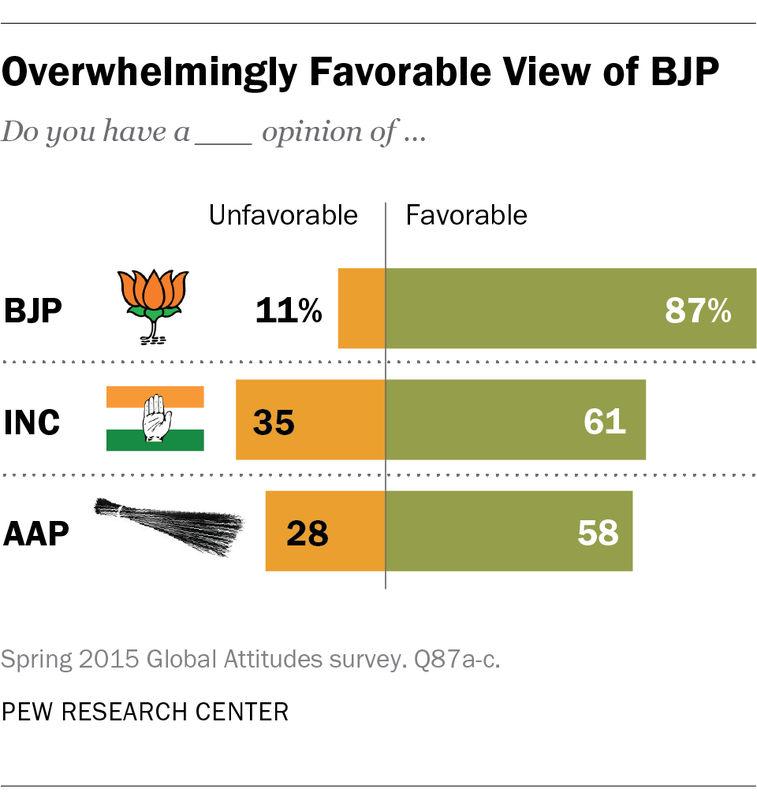 A majority (58%) of Indians also have a favorable view of the AAP. There are no significant age, gender or urban-rural differences in that support. Indians’ backing for their prime minister translates into faith in him to do the right thing regarding world affairs. Roughly nine-in-ten (91%) have confidence in Modi’s handling of international relations, including more than seven-in-ten (73%) of those surveyed who express a lot of confidence. Again, the intensity of his own party’s support is striking: 83% of BJP adherents have a lot of confidence in Modi as a statesman, compared with strong support from 63% of Congress backers. In 2011, 80% of Indians surveyed had confidence in the foreign policy approach of Modi’s predecessor, Congress party Prime Minister Manmohan Singh. This included 56% who had a lot of confidence. There are regional differences in the intensity of public confidence in Modi’s record on foreign affairs. The greatest support is among Indians living in the eastern states (81% very confident) and the northern states of Delhi, Rajasthan, Haryana, Punjab, Madhya Pradesh and Uttar Pradesh (80% very confident). Indians in the southern states (63% very confident) as well as the western states (62% very confident) are relatively less intense in their backing of the prime minister’s handling of world affairs. Indians are particularly supportive of Modi’s dealings with the U.S. About two-thirds (66%) approve of the job he is doing handling relations with Washington, just 13% disapprove and a relatively modest 22% have no opinion. But Indians are critical of the prime minister’s conduct of relations with neighbor and long-time adversary Pakistan. Just 25% approve of his dealings with Islamabad, 50% disapprove and 25% have no opinion. This disapproval is shared among supporters of all parties, including Modi’s own BJP. Notably, public confidence in Modi’s handling of international affairs has not translated into broad support for his relations with two other world powers: China and Russia. Despite visits to India by both Russian President Vladimir Putin and Chinese leader Xi Jinping, and Modi’s reciprocal visits to Russia and China, just 39% approve of the prime minister’s handling of relations with China and only 37% approve of his dealings with Russia. This low level of support in part reflects the fact that about three-in-ten or more in those surveys voiced no opinion on either topic. But Indians do approve of Modi’s handling of a range of domestic issues. This may be due to the fact that, contrary to their lack of knowledge about the prime minister’s conduct in foreign affairs, almost all Indians have an opinion about Modi’s domestic policies. In his Aug. 15, 2014, Independence Day speech, the prime minister promised greater access to toilets across India, a country where less than half the population is estimated to use such facilities. This initiative – building clean public restrooms in slums, rural areas and schools – has the backing of 71% of those surveyed. Roughly two-thirds of Indians also approve of Modi’s efforts to deal with unemployment and terrorism. BJP followers (71%) are more supportive of the prime minister’s handling of terrorism than are Congress adherents (56%). About six-in-ten or more Indians also give a thumbs-up to Modi’s efforts to deal with rising prices (63%), help the poor (63%) and fight corruption (61%). AAP followers are particularly critical of the prime minister’s handling of corruption, their signature issue: Just 40% approve, while 51% disapprove. And half disapprove of his efforts to combat unemployment. Modi’s lowest approval on domestic issues comes in his management of communal relations – the day-to-day interaction between majority Hindus and minority Muslims, Jains, Sikhs and Christians among others, as well as the relationship between the various castes in the country. Communal relations are a particularly sensitive issue for Modi and his Hindu nationalist party. Just over half (53%) of those surveyed approve of Modi’s stewardship of communal issues, while 35% disapprove. Indians with at least some college education (64%) are more likely than Indians with a primary education or less (48%) to back his handling of these tensions. And, as might be expected, BJP supporters (57%) are somewhat more positive about his record on communal issues than are Congress followers (47%).